After dinner at Yee Bo, we wanted to look for a place to have a couple of Angkor Beer. 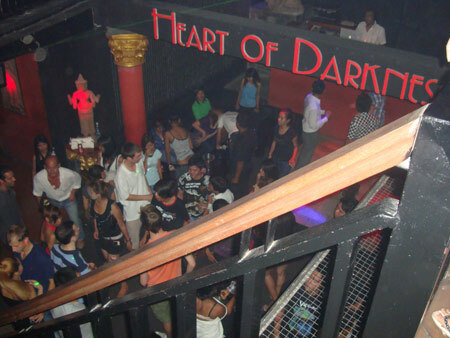 Zach made a research online and told me that most of the elite crowd of Phnom Penh frequent this disco that goes by the name of Heart Of Darkness. The hip call it HOD but the tuk tuk driver just call it Disco Heart. I’m not really into loud music anymore as I’m inching towards the senior citizen status. Since Zach and Eddie would like to check it out, being a cool traveling companion, I followed the majority vote. The disco is really small in comparison with the discos or clubs that I’ve been to around the world. From the outside the disco look like a shop house. You go through some bouncers checking for guns and hand grenades. 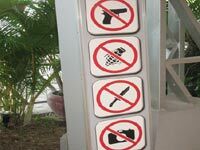 I’m not exaggerating on the hand grenade part as I saw the sign stating no guns and hand grenades allowed. I read some comments online about HOD that some embassies advice the employees against going to this club. Some shoot out incidents happened before but I’m not sure if there’s fatality. The club is famous amongst the sons of high ranking government officials and army generals. They would normally get to go into the club without the customary body search. I have to admit the article on the net regarding HOD did make me a little bit nervous but I told myself what are the odds of a shoot out that night. Upon entering the club, I see people are dancing away to the latest pop music. We ordered 3 bottles of Angkor Beer. Price of the beer is USD3.50 for a big bottle. That’s really cheap considering this is the hippest club in town. They are many Westerners there too, male and female. Is a very popular among the expat community and also NGO workers. My nervousness died down after seeing people looking very relax and of course finishing one big bottle of Angkor Beer in few minutes helped too. The music wasn’t too loud and I enjoyed observing the crowd. While drinking my beer, a very nice aroma of fried food caught my attention. I looked around and saw a waiter carrying some fried food to some customers. I signaled the waiter to come over and asked him what he was serving to the guests. He told me it was fried chicken wings and pork ribs. He asked me if I would like to order and he will go outside and buy it for us. Since we were full after a heavy dinner, I politely decline and asked him where did he buy it. He told me the stall is just opposite the disco. I mentally told myself that I will come back again tomorrow just to taste those fried goodies. We continue to drink more beer and after several big bottles of Angkor Beer, I got the courage to ask the supervisor if I could snap a picture of the club for my blog. He obliged and took me to the upper portion of the club and I started taking some pictures. I thanked him and ordered a few more beers just to show him my gratitude. After 8 bottles amongst the 3 of us, we felt buzzed and I know we will have a good sleep that night. We went back to our hotel and I will surely return again the next day to try out the fried goodies. I wonder if the phrase “the food is worth dying for” could be apply here. The warning signs are great. I wonder how many people forget about the grenades in their pockets. LOL!